Portland only notched five hits, but they made them count as five runs came across in the win. Josh Ockimey, who hit his eighth home run, and Luke Tendler each had two hits. Tendler had three RBI, including a two-run double in the second. Kyle Hart pitched seven one-run innings on five hits, allowing one walk. Despite the strong start, he did not record a strikeout. Jordan Weems surrendered one hit in the eighth and Trevor Kelley pitched a perfect ninth. The Red Sox scored eight runs in the first three innings and held off Winston-Salem's comeback to break a three-game losing streak. Santiago Espinal (pictured, right) had three of Salem's 10 hits and had three more RBI to lead the way offensively, backing up Jake Thompson's strong start. He pitched six innings, allowing two runs on five hits. He walked a pair and struck out five. Bobby Dalbec began the offensive onslaught with a two-run home run in the first inning, his 13th of the year. Lorenzo Cedrola's RBI single in the sixth proved to be the difference as Greenville earned a combined shutout from Jhonathan Diaz and Marcos Lantigua. Diaz allowed just two hits in seven innings of work, with a walk and six strikeouts. Lantigua finished the final two frames, with one hit, a walk and a pair of punchouts. Michael Osinski doubled home Cedrola two batters later with an RBI double. The two teams were tied 5-5 after five innings, but the Royals added four runs over their final four at-bats to take the win. Ceddanne Rafaela hit a solo shot in the third, his first on the young season, while Erick Flores, Gilberto Jimenez, Leonel Jimenez and Lewis Baez each had multi-hit efforts. Manuel Ramirez pitched four innings of relief, allowed two runs, one of which was earned, on three hits. He struck out two and walked one. Top prospects Antoni Flores and Danny Diaz continue to impress in the early going. 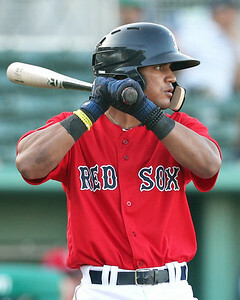 Flores was 2 for 5 with a pair of RBI, and has a .389 OBP and six runs driven in through four games. Diaz blasted his second home run of the season, a two-run shot that came as part of a seven-run romp through the eighth inning. Starter Carlos Velez struck out three without issuing a walk, allowing one run in four frames. Alejandro Crisostomo gave up a run in three innings of relief to get credited for the win, and Geraldo Perez locked down the contest with two scoreless. Player of the Day: Though Espinal had three hits, Jhonathan Diaz gets the nod. He put up a great start for a scuffling team to help the Drive to their third shutout win of the year. The 21-year-old has just a 1.09 WHIP and has 64 strikeouts in 61 2/3 innings this season, after pitching just 88 2/3 innings in Greenville last year.